SuperPhillip Central: Reggie Fils-Amie: "The Gaming Community At Large... Is Insatiable" And He's Absolutely Right. 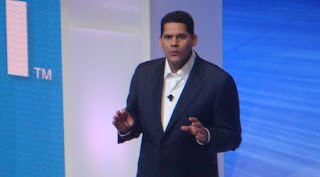 Reggie Fils-Amie: "The Gaming Community At Large... Is Insatiable" And He's Absolutely Right. Fils-Aime: One of the things that, on one hand, I love and, on the other hand, that troubles me tremendously about not only our fanbase but about the gaming community at large is that, whenever you share information, the perspective is, 'Thank you, but I want more.' 'Thank you, but give me more.' I mean, it is insatiable. "I have heard people say, 'You know, you've got these fantastic franchises, beyond what you're doing in Smash Bros., isn't there a way to leverage all these franchises?' So we create Nintendo Land and they say, 'Ho-hum, give me more.' So it's an interesting challenge." You know what the sad thing is about that comment? Some would call it damage control or Mr. Fils-Amie is acting out like a baby. 1) I don't think gamers have any right to say anyone other than themselves are acting like babies. Case in point at all of the comments in this NeoFAQs topic, and 2) His quote represents the god's honest truth. Nintendo fans are without a doubt the most annoying fan group in gaming. More obnoxious than Sony fans, Sonic fans, and even Zelda fans. What's more irritating than a happy fan (i.e. "Nintendo wins E3 just by being there!" ...How did that work out?)? A severely angry and dejected one. Nintendo is launching the Wii U with a solid lineup of games for all age types like Rayman Legends, LEGO City Undercover, Darksiders II, ZombiU, Assassin's Creed III, Project P-100, but it's never enough. A new Mario at launch for the first time on a Nintendo console in several generations? Doesn't count. It's 2D and is a "crappy" New Super Mario Bros. rehash. Mario is the new Call of Duty. It's not a real Mario game (whatever that means). New Pikmin? Fans cried out for this sequel, and now it's coming and they don't even care. And most simply dismiss Nintendo Land as a throwaway mini-game collection. Damn that genre! I hate it! How could people like it?! How dare they desecrate my favorite franchises by putting them in shoddy mini-games? This is even though the majority of impressions for six of the mini-games (the only ones shown so far) have had extremely positive input from those who, y'know, have actually played it. Not those who think anything that is supposed to appeal to everyone (and not just casuals) is garbage. Nintendo Land is most likely a game that is supposed to interest players who probably wouldn't otherwise be interested in Nintendo's franchises and give them a sampling. Who is to say that these players won't be coaxed by F-Zero or Metroid and get into those series? Oh, wait. I forgot. The typical gamer hates having casuals in their hobby. They think the casual gamer is a blight on the industry and should get their own hobby because the typical gamer is seriously selfish. But no, this gamer wants a new Star Fox, a new Metroid, a new F-Zero, a new Wave Race, and they want them now. But even when they get announced they'll demand more, or when they are released they'll have the gall to whine and moan about them or how they "butchered" the games. Reggie Fils-Amie's position is very much understandable, so the people saying he's clueless when he is actually right on the money must be the sect of gamer he is referring to in his interview. The fact of the matter is that Nintendo can never win with people. Never. I hate coming off as an extension of Nintendo's PR here, but between defending Nintendo and defending the piles of crap that are gamers, I have to go with the lesser of two evils here, and that is actually Nintendo sadly. Amazing. A lot of gamers are snobby, snotty, selfish, entitled, elitist, miserable, demanding, whiny, reprehensible, bratty, exclusionary, self-hating nerds. They are a primary reason why this industry is pooped on so much and why the mainstream doesn't take it seriously. I always like to trumpet how I am ashamed to be associated with this group of gamer, and it looks like the trend will no doubt continue for years to come as long as Nintendo fans and the gaming community keep feeling overly entitled and are constantly nagging. Le sigh. For more articles, editorials, and special segments, check out the SPC Feature Catalog. Rank Up! - New Play Control!